Posted by Jenny in Boer War, memoir, travel. Our faithful bus, seen here at Elandslaagte. Photo by Sonja Myburgh. It was toward the end of the first day that I really started to notice it. My fellow bus-mates—these very serious people, so very dedicated to the history of the Anglo-Boer War—were laughing up a storm! In the seat in front of me, Danie de Villiers and Ferdi Preller were having a regular hee-haw! All down the aisle, as our bus trundled onward toward the Platrand Lodge near Ladysmith, could be heard the sounds of miscellaneous laughter and guffaws. You might think, given that every single one of the jokes being cracked was in Afrikaans rather than English, that I might feel a bit left out. That was not the case at all. 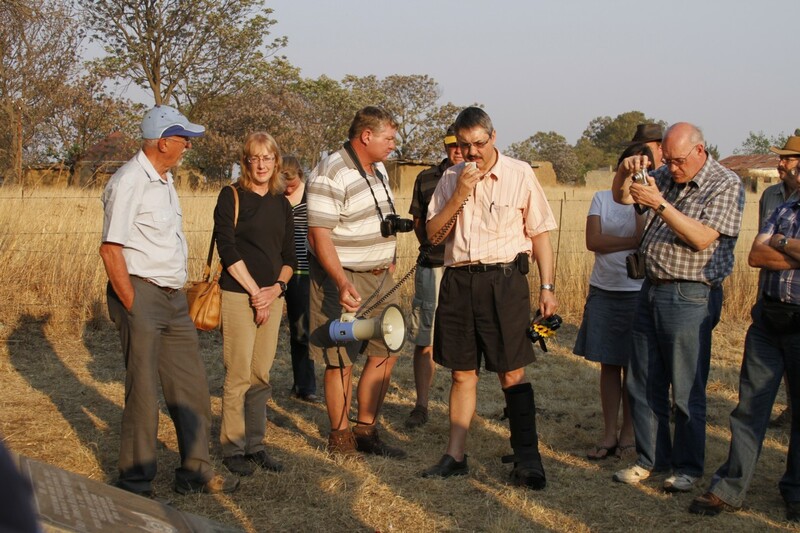 I do realize that I missed out on considerable amounts of information and humor throughout the duration of the tour, given that much of it was communicated in Afrikaans. (I will discuss the language aspect of my experience in a future post.) Yet I felt very much included in the group. My bus-mates kept slipping across or up or down the aisle to sit next to me and confide to me various things that they wanted me to know about. (They all spoke excellent English.) A mysterious and powerful feeling of fellowship pervaded the group: a sense of strong commonality. These people had a shared past, most of them descended from the Dutch and the French Huguenots who’d come to South Africa several hundreds of years ago. It seemed that the whole subculture had only about fifty last names between them. Yet they wanted me, this oddball American woman, to feel that I was part of the group. Jokes are possible even at Spion Kop. Photo by Sonja Myburgh. Norman Nelson, retired from a lifetime spent farming in the Free State, wanted to discuss the events of the Dust Bowl with me. Ferdi Preller, former school principal, chatted with me about his recent experience mentoring new heads of schools. Louina Marais, representing the Pretoria branch of the Anglo-Boer War Museum, told me she has a relative in North Carolina! Danie de Villiers struck a gallant pose toward me. One evening, as I sat at my table in the Platrand Lodge dining room, he kept bringing over vases of flowers from other tables and setting them on all sides of my placemat, creating a miniature garden of sorts. 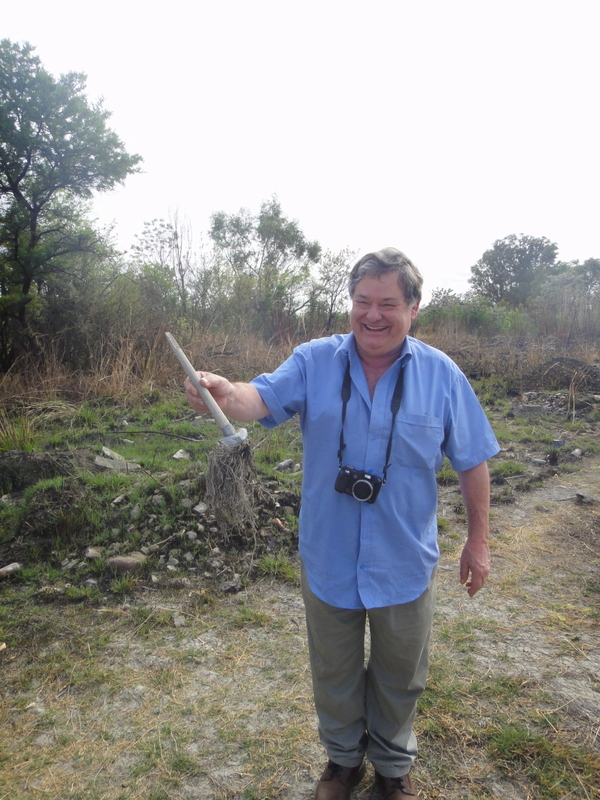 On the last day of the tour, he took a different tack and pretended to offer me a broom for flying back to the U.S…. He and Alan Woodman conducted a mock competition for my attention, Alan winning the final point by pretending the picture he was taking of me was going to be used as a screen saver. I became familiar with the laughter of particular individuals of our group. I quickly learned that whenever I heard a particularly tumultuous explosion of laughter, Suzette Botha would be at its epicenter. 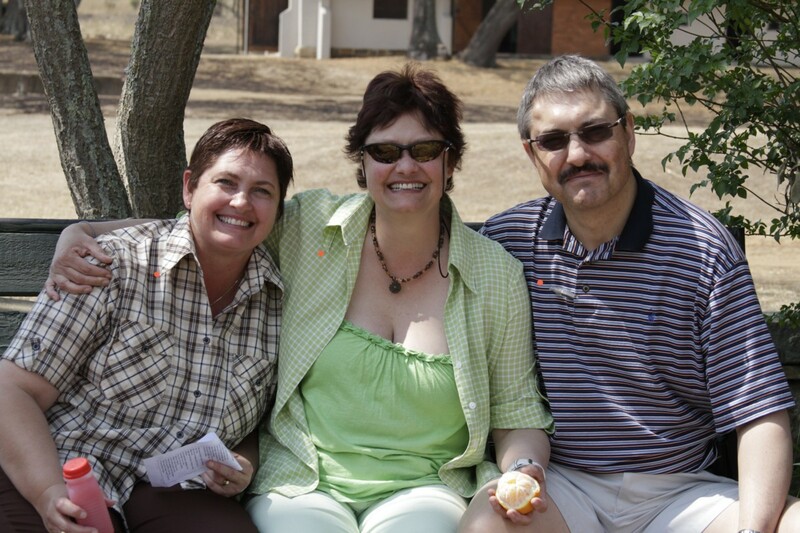 Suzette and Maryke van der Westhuizen are the sisters of my host Arnold van Dyk, and I enjoyed much conversation and amusement with them. The topics varied wildly, ranging from what kind of underwear should be worn in cold weather to an interesting list of words that were innocuous in English and dangerous in Afrikaans—and vice versa. Maryke, Suzette, Arnold. Photo by Sonja Myburgh. I had conversations that were of a more serious nature. 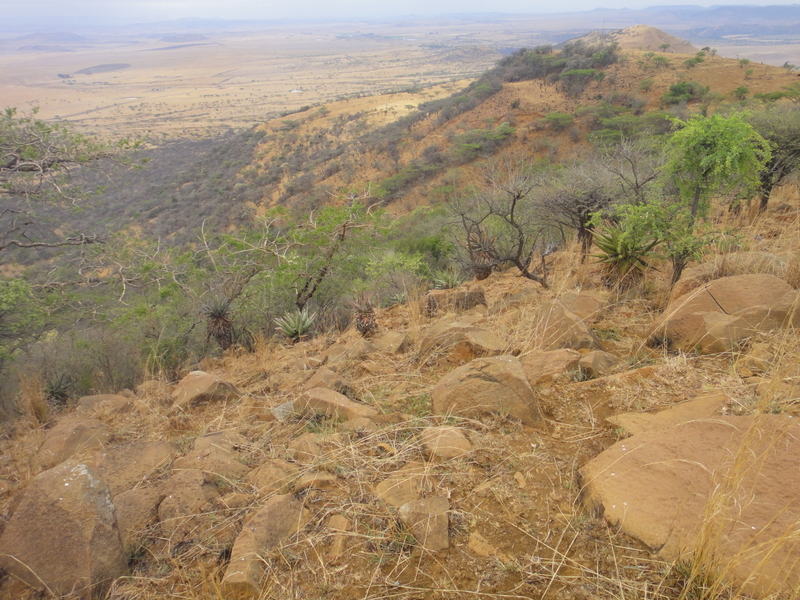 As we rode up to the top of Spion Kop, Professor Kay de Villiers told me that he conceived of the mountaintop as a mythical setting, such as that described in the Iliad. This led to a discussion of poetry that touched not only on Homer but on Louis MacNeice and C.P. Cavafy. 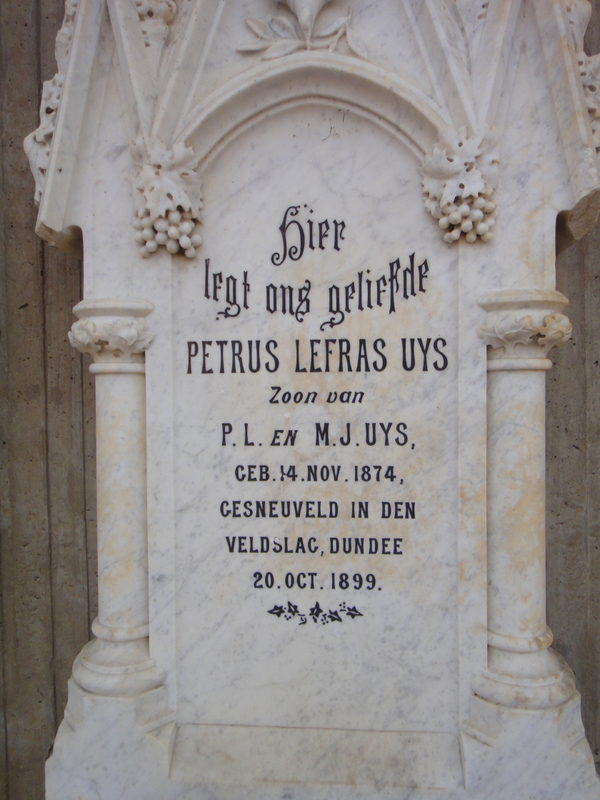 Professor de Villiers is an expert on the history of medical care during the Boer War, and he contributed much information on that subject to the group. His interest in poetry somehow did not surprise me. 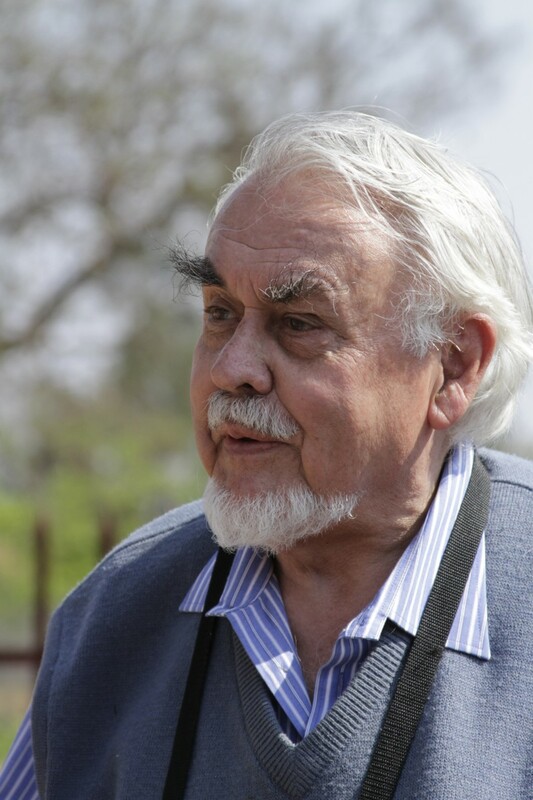 Professor Kay de Villiers. Photo by Sonja Myburgh. 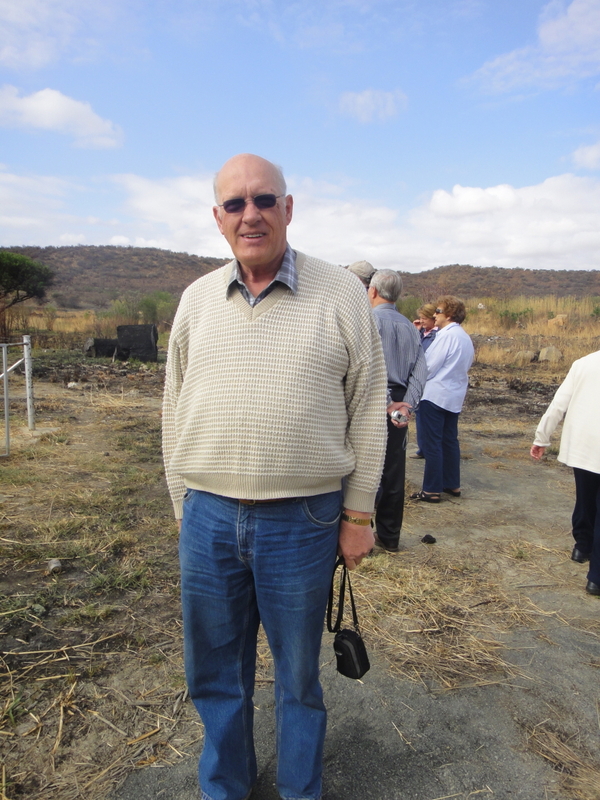 Johan Wolfaardt created a wonderful moment at Rietfontein, when he led several members of the group in singing the anthems of the two former Boer republics, the Transvaal and the Orange Free State. He actually knew all the verses. 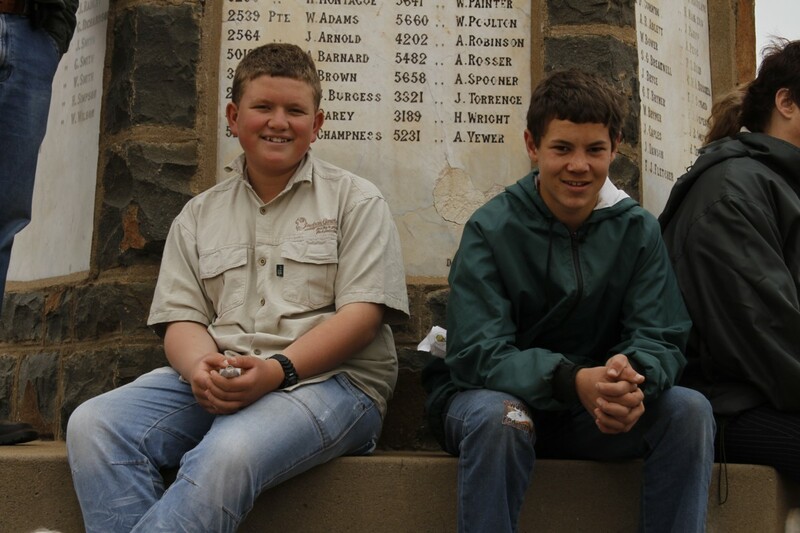 Johan works with the Anglo-Boer War Museum in Bloemfontein (the sponsor of our tour) and is involved in reenactments. His knowledge of the war is encyclopedic. It turns out that one of his ancestors lived in America, and Johan knows more about the Civil War, the American Revolution, and the Mexican-American War than most Americans do. 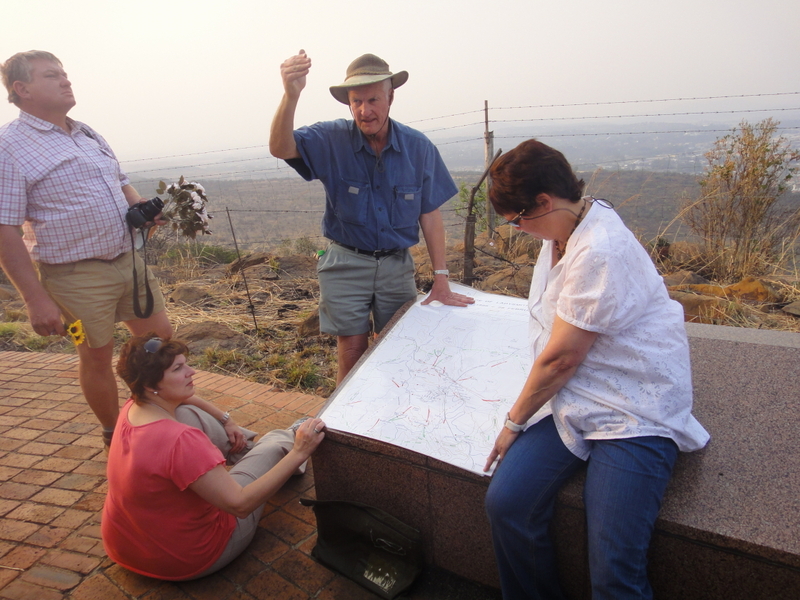 Steve Watt, who served as our primary guide, spoke of the battles in entertaining detail, pointing to large maps to show us the movements of soldiers and describing the events with enthusiasm. Particularly noteworthy was his recounting of the death of General Penn-Symons due to a bullet wound at the battle of Talana Hill, when Steve gave us the sound effect of the speeding bullet and dramatized the moment with gestures illustrating its trajectory. Two members of our group were the young Willem van Straaten and Stefanus Naude, who seemed to enjoy most of the proceedings. Willem and Stefanus. Photo by Sonja Myburgh. Thank you, everyone, for contributing to a unique and memorable experience. 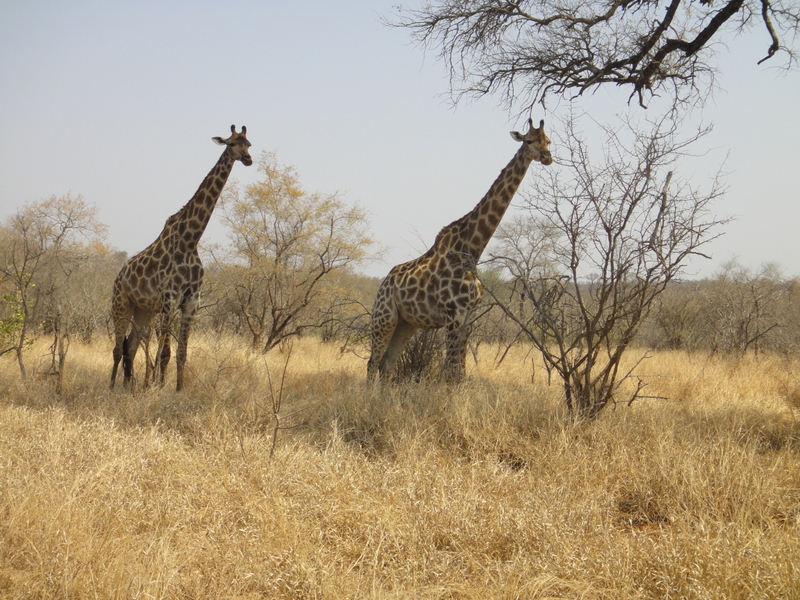 Posted by Jenny in Boer War, nature, travel, wildlife. 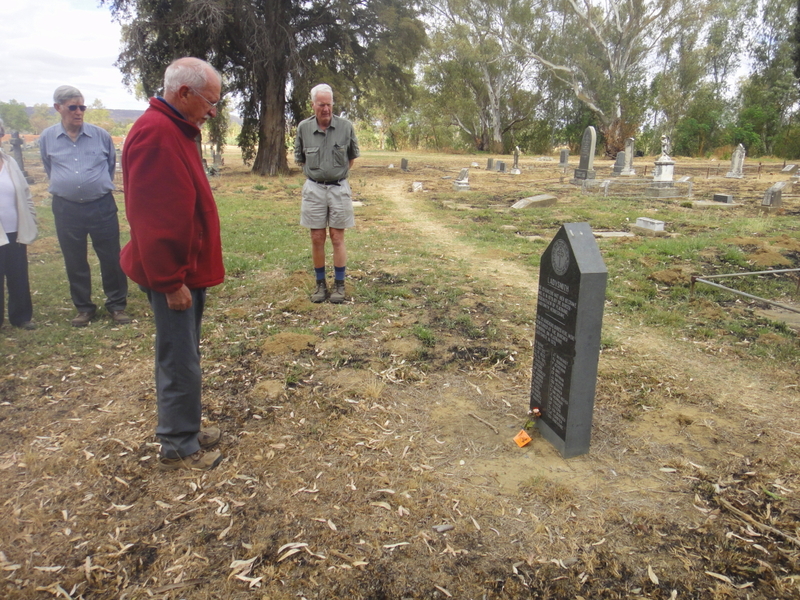 I look at the grave of a fighter from the Harrismith commando while Arnold gives historical background. Photo by Sonja Myburgh. It’s difficult to summarize my recent trip to South Africa in a sentence or two. 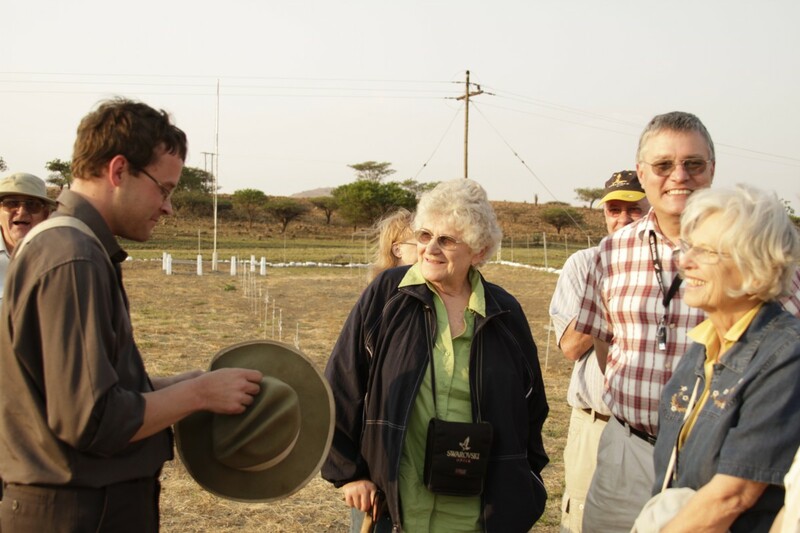 Let’s try this: I visited battlefields of the Boer War, but more importantly, I became friends with a group of smart, interesting, talented, experienced people who bring unparalleled knowledge and dedication to the subject. 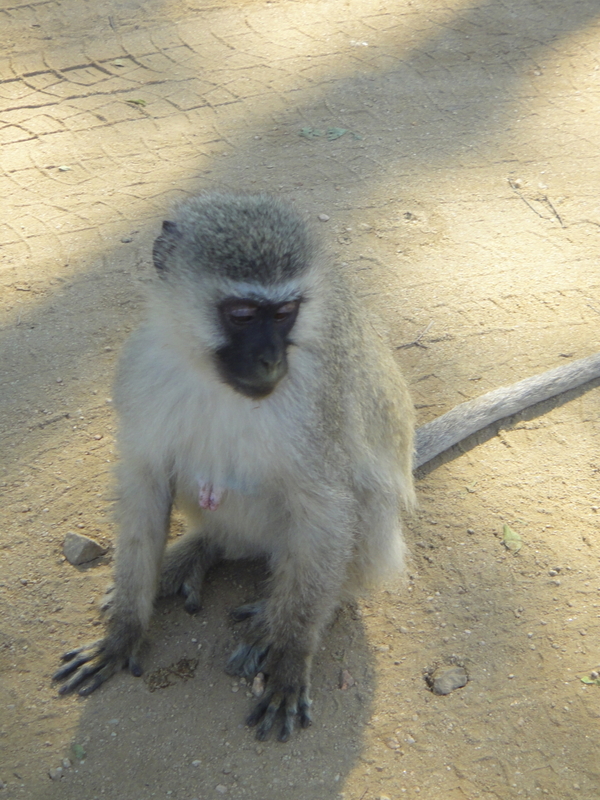 I visited Kruger National Park, but more importantly, I glimpsed a world teeming with forms of life that seemed exotic and lovely, inventively formed and beautifully designed. I plan to write about my experiences in a series of posts. In this first one—an introduction—I want above all to thank Arnold Van Dyk and his fiancee Sonja Myburgh for their incredible hospitality and generosity. They took me into their home in Bloemfontein, treated me like family, and at the conclusion of the battlefield tour drove me all the way over to their vacation place on the border of Kruger. 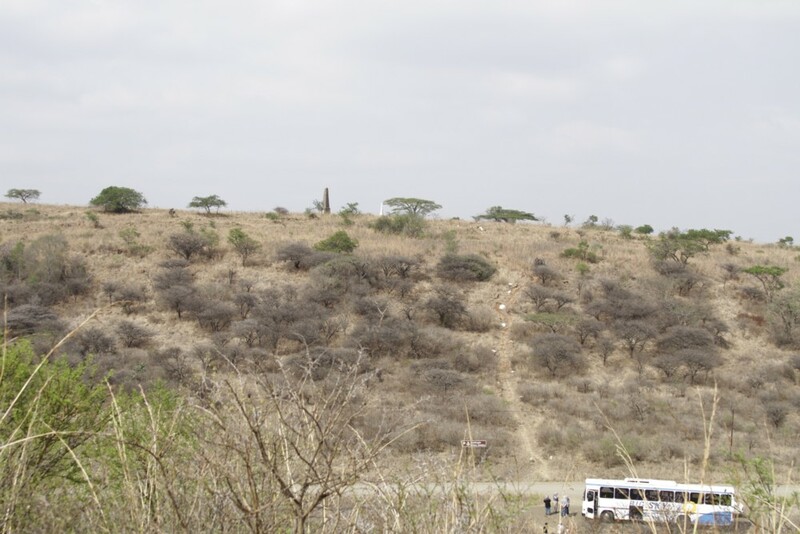 There, we joined forces with their friends Klaas and Carol van der Westhuizen to drive over large sections of the southern part of the park. 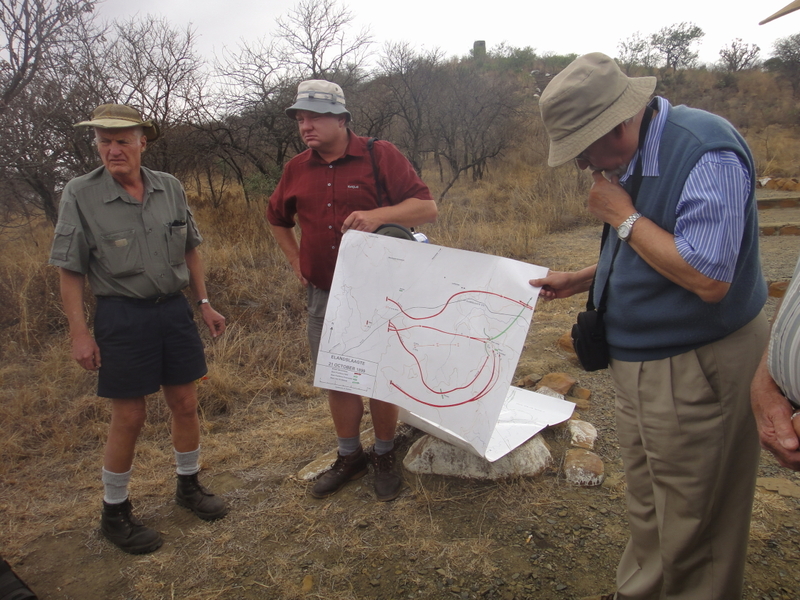 These are all “old hands” at the Kruger experience who gave me all kinds of information about wildlife. 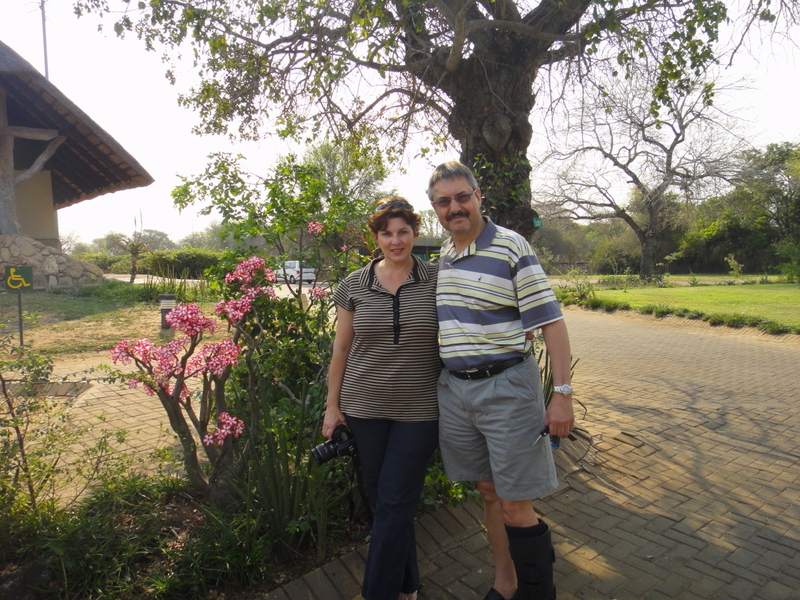 In their “real lives,” Arnold is a radiologist with a thriving practice in Bloemfontein. 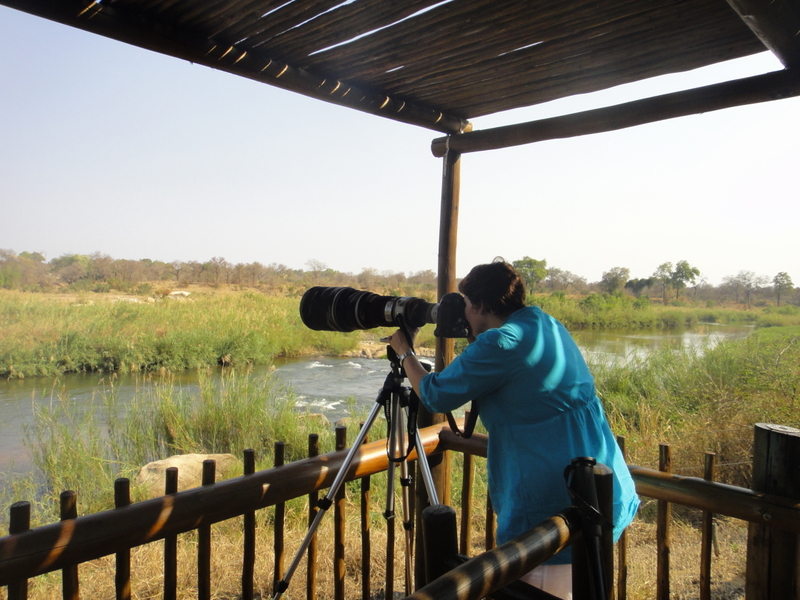 Sonja has a background in radiography and information technology, and travels to places inside and outside South Africa to provide training and consulting. 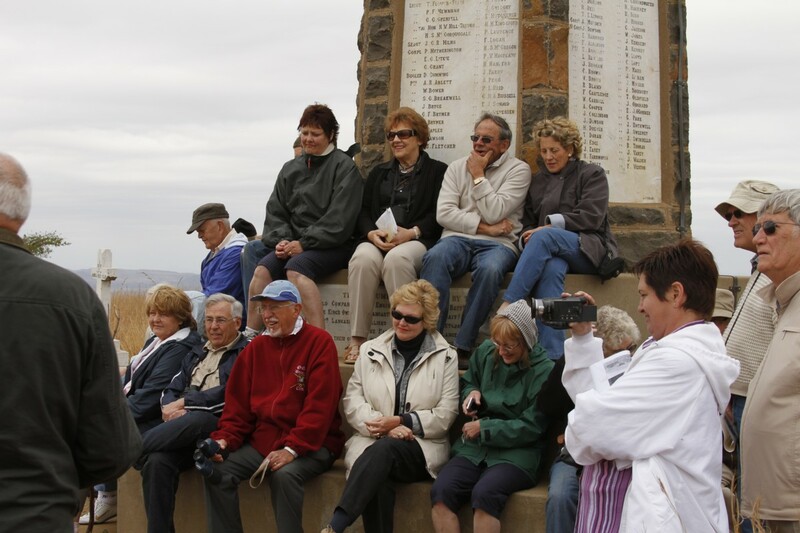 She is also president of the Bloemfontein Camera Club and a very talented photographer. I will be borrowing some of her photos in my posts. …and learned about the sequences of events. 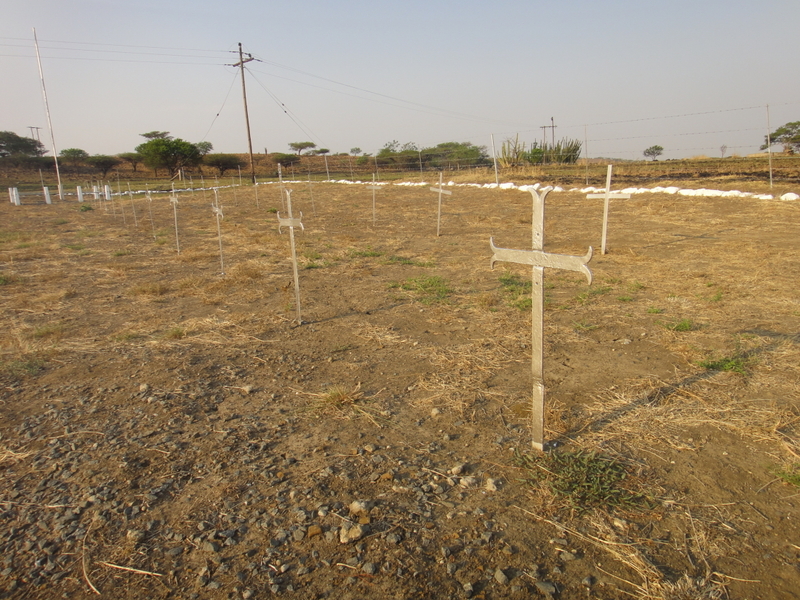 At many cemeteries and memorials, we placed flowers to honor the fallen. 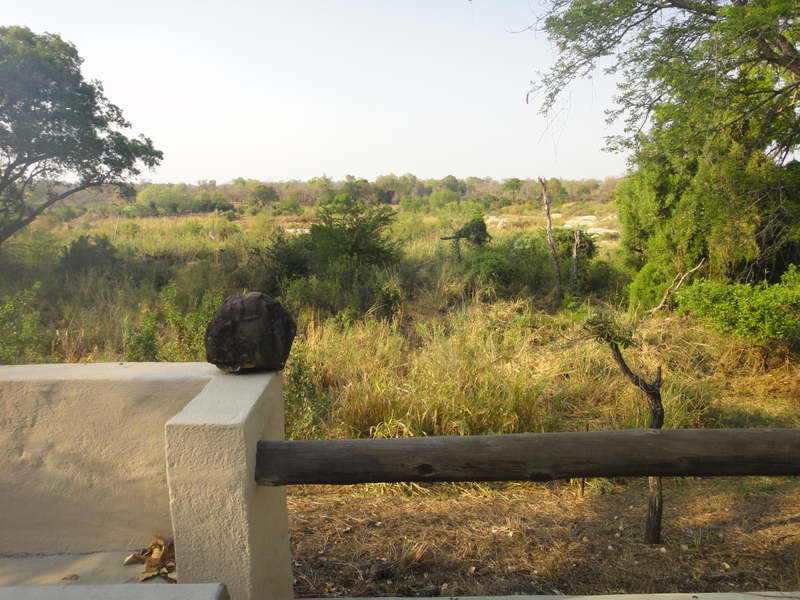 Over on the border of Kruger, our party of five relaxed on the stoep, from where we saw elephant and buffalo, hyena and kudu. 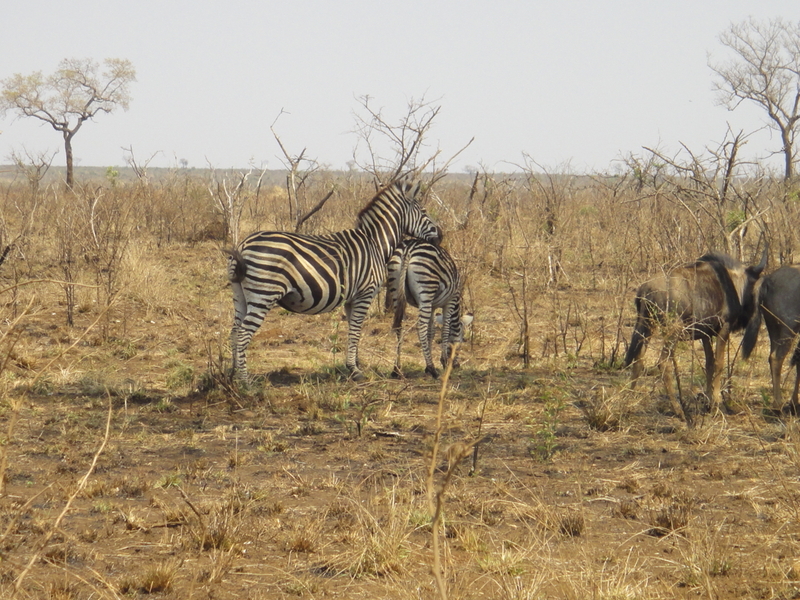 …to zebra and blue wildebeest. I’ll be sharing more details over the next weeks. 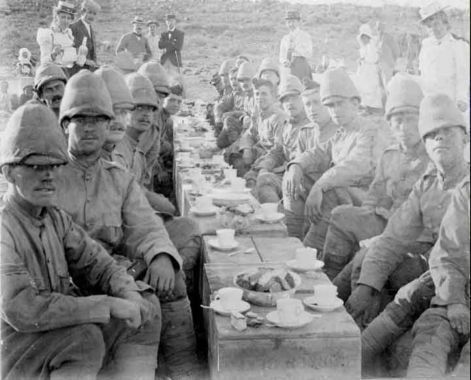 Posted by Jenny in Boer War, history, military history, poetry. 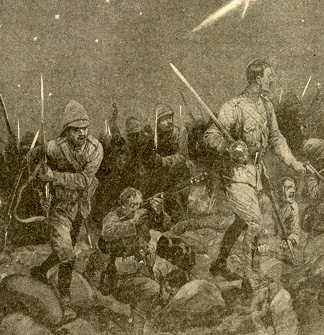 This illustration is captioned simply "Boer War skirmish." It depicts the British side. From Hugh Barty-King, The Drum: A Royal Tournament Tribute to the Military Drum, London, 1988: “Most people are unaware of the vital role played by the military drummer in communicating strategy and keeping the machinery of battle oiled…. For a rousing contemporary video of a corps of military drums—no historical relevance here, just something to give a nice feel for what this instrument can do—watch this video. Ordinary British soldiers. The Boers called them "khakis" or "rooineks," the latter for their sunburned necks.